Alan has been to Bougainville Island several times. When the mine was operating at Panguna expatriate workers were flown in from Australia and New Zealand, plus from other provinces of PNG, all engaged directly or otherwise in digging an enormous pit and extracting copper and gold, earning money that to a large extent supported the PNG government as well as the mining company owners. 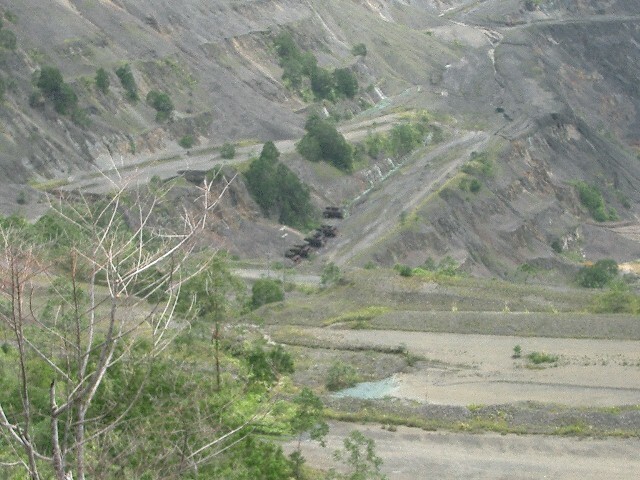 This situation continued for many years until several points of friction between the mine operations and the Bougainvillean people arose and resulted in a rebellion against the central PNG government, and removal of all expatriate workers by the mine operators as the conflict escalated. In the course of this mini war people were killed and all the mine infrastructure was destroyed including the airport and the power station. This latter was the first to go as it was the most vulnerable and when it was shut down the town of Arawa could no longer operate in any meaningful way. The conflict dragged on for some years and relatively recently the peacekeeping force was removed and the local population agreed to work towards self government and to reinstate all those elemnts of commerce that would be needed, such as banks and schools and power generation. It must be said that the people of Bougainville are an innovative and cheerful lot, deeply christian and unfailingly positive of outlook. Even now, with no official institutions in place, the old mining town of Arawa is perfectly safe to walk down a street at night. These people are interested and know everyone else and wholeheartedly work together to earn the small incomes they need to survive and to educate their families. This latter is a very difficult factor. When the mine was operating it provided a steady support, directly or indirectly to the schools and institutions of the immediate area. 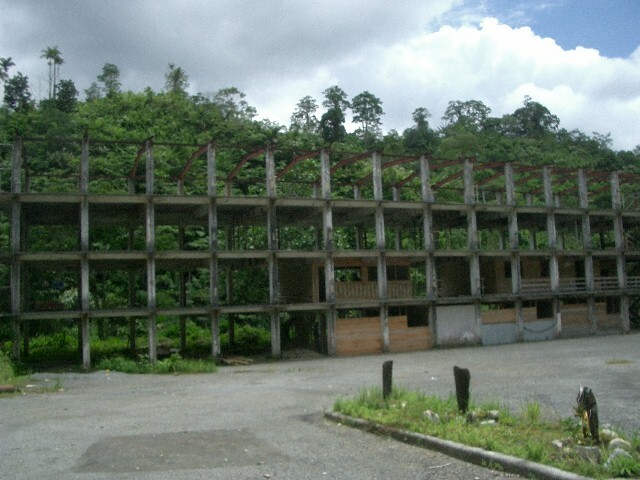 The central PNG government has insufficient resources to support the place and as a result most institutions are self-help. 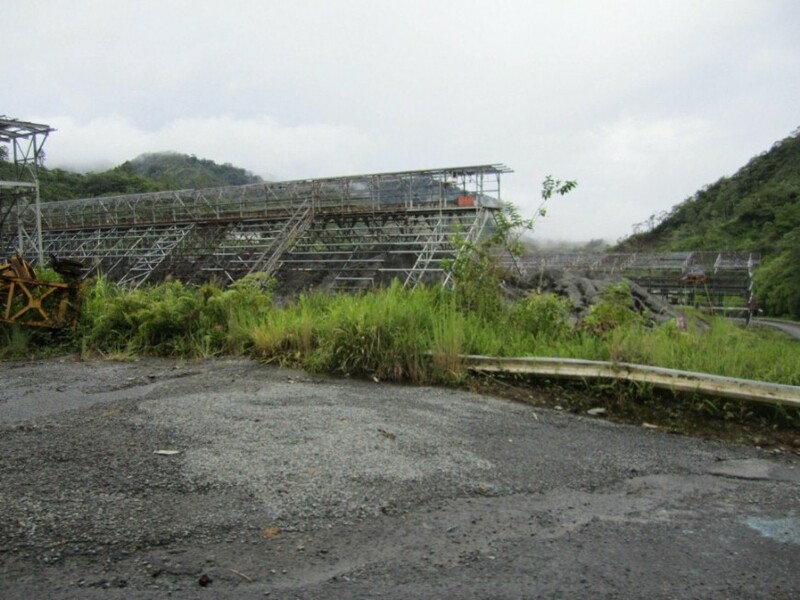 Bougainville still aims to be independent but has come to see that without the mine or similar scale commercial activity they cannot elevate their people to the level they desire. Many people are very much against reopening the mine; their emotional scars are still raw, but slowly and steadily landowners and ex rebels are coming to a common understanding. In this they are assisted by a cadre of ex mine nationals, local people who were educated to a high standard by the mine all those years ago and who want their families and wantoks to regain a lot of the prosperity they once had. During the troubled years the PNG government attempted to militarily impose their will, but were unable to do so. In the end a stalemate was reached and they and their hated Defence Forces were only able to keep a toehold on the small island at the northen tip of Bougainville known as 'Little Buka'. That island is separated from the 'mainland' by a 500 meter waterway now serviced by a small fleet of 'banana boats' that carry all and everything across the gap. The airport is on the Buka side, and there are commercial flights in and out of that airport. The original Aropa airport is three quarters the way down the island, and during the troubles it was rendered useless by laying trees across the runway and by digging ditches across it. During the years with peacekeeping forces this airport was repaired and is fully operational at present except to certification by the Civil Aviation authority. No doubt any would-be miners will see resurrection of this nearer facility as an urgent matter. 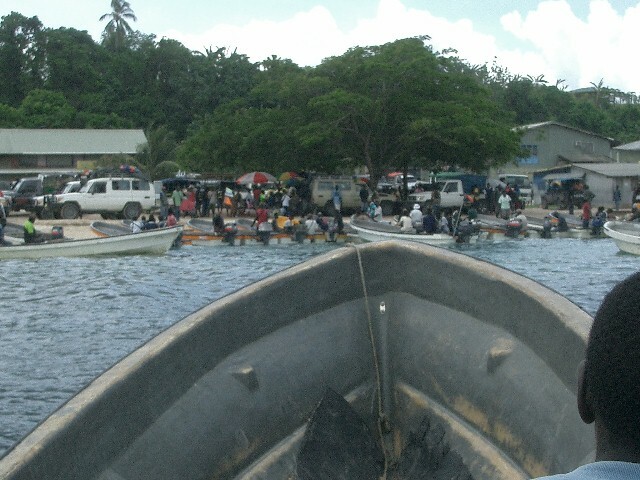 Meanwhile it is necessary to take a 'taxi' from the Buka Channel up to the town of Arawa. 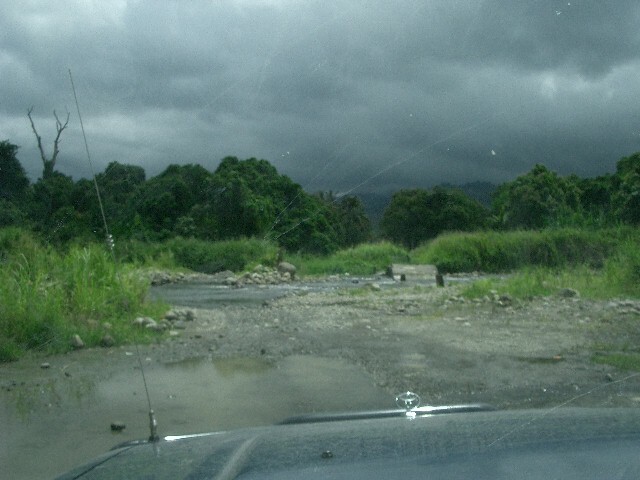 This is an interesting journey as it has to ford rivers that regularly flood with torrential rains in the hills. Without such interruptions the trip takes a jolting four hours or so in a 4WD that is literally bulging with people, all cheerfully holding on or pushing at the tricky parts as needed. One of the first things one observes of the Bougainvillean people is their smiles, brightly cheerful against their amazingly dark skin. They are tall and athletic and have a great sense of humour even when they don't. Their language is a mish-mash of incredibly fast pidgin blurred with local dialects. The Christian influence is all-pervading; a large proportio of the population follows the teaching of the Seventh Day Adventists, and the remainder are more traditional, but the result is that both Saturday and Sunday are days of the Lord and every church has crowds of immaculately dressed people attending on their chosen day. Alan was on the island twice during the years of the mine and considers the place to be one of the most beautiful spots on a well travelled globe. Subsequently he has been back in an official capacity to oversee the removal of radiation devices left from the mining years. These devices had been used to monitor processes and slurries in pipes and the original mining company underwrote a program to recover and remove these as a necessary first step to local discussions with landowners. Stipping the old mine has become quite a local industry and even now the fifteen enormous mills from the concentrator are being dismantled, taken down the mountain road, then shipped out to various places in the world where they are refurbished and resold into other mining sites. It might be thought that this would not be economical, but in fact even if a mill costs a million dollars to ship to the workshop, and another two million to refurbish, it is still cheaper than a new mill to all those mines out there who will then be willing to pay the additional cost of onward shipping. 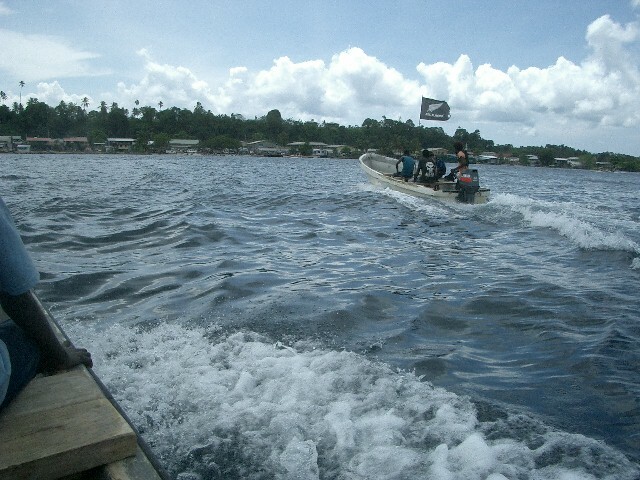 Crossing the Buka channel to the 'mainland' in banana boats. Note the Kiwi silver fern flag. The mine is in the mountains above the town of Arawa, and a road winds its way up and over the cloud-shrouded ridge then down to Panguna on the opposite side. 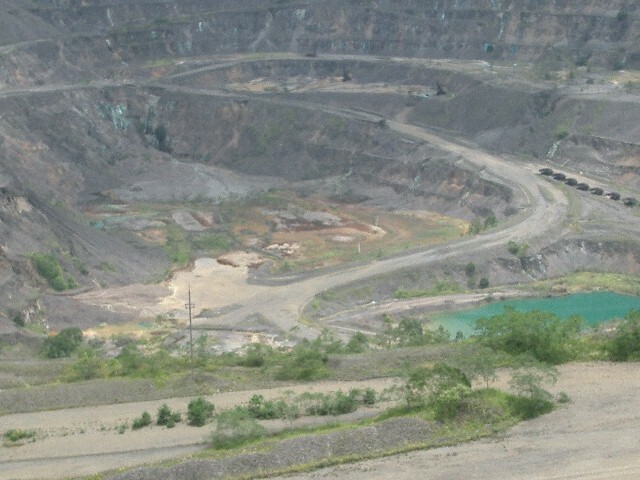 Originally the mine was a peak in the mountain range but it was progressively mined to an enormous pit. When you stand at the botton of that pit it is difficult to realise where you're at, for instead of being aware of the walls of the pit you see them merely as ridges and banks centered on where you stand. When Alan first arrived the rainfall was a serious problem, flooding the mine and causing the streams that spilled into it to tumble rocks down the slopes. To overcome this engineers dug a long tunnel from the Jaba River outflow to the centre of the pit proper where they fitted a plug. This allowed them to draw the water away as if in a bath. No sooner had they completed this tunnel than the weather pattern changed and they were short of water and obliged to use the same tunnel to pump water up towards the process plant. Processing the ore consisted of blasting it out of its matrix, then trucking it up and out of the pit to a huge primary (first) crusher. At the time of the troubles it had been planned to do much of this coarse crushing in the pit and transport the result up and out with a conveyor belt. Additional stages of crushing reduced the ore to a coarse sand that was stockpiled prior to feeding it into a series of mills. Stockpiling allowed the mine and the concentrator plant that did the rest of the processing to operate independently. Mills are very large barrels that rotate with a composite load of rocks and steel balls. This particular mine used these 'ball mills' exclusively, but more recent mill designs use 'SAG' (semi-autogenous) mills and 'FAG' (fully autogenous) mills that are of a size and shape that allow the rocks to pulverise themselves. These latter are commonly followed by a standard ball mill which crushes the output of the initial machines. The purpose in crushing and grinding is to increase the surface area of the particles and allow a separation process to recover the metals. 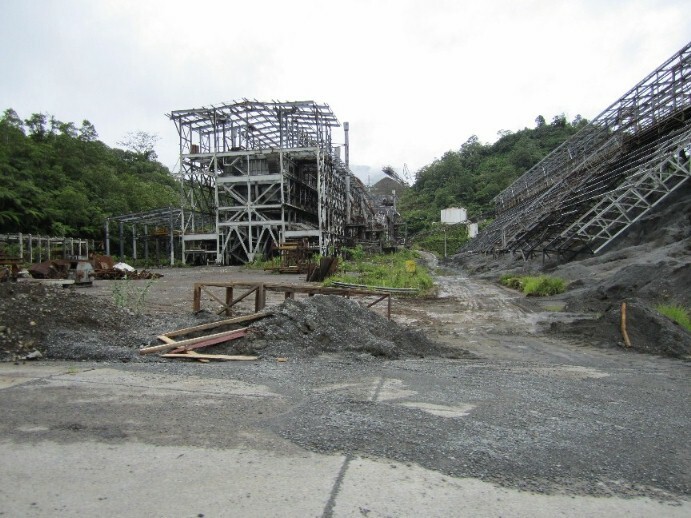 Modern plants often use cyanide leaching that chemically strips the gold, but in this particular Panguna mine they did not do that; the very fine material was mixed with a different chemical to cause it to froth and foam. This froth contained the metals like copper, gold and silver, and when it was scraped off it was pumped down to the coast where it was dried and shipped out to smelters that were able to sepearate the specific metals and so purify them. The Bougainville mine was ostensibly a copper mine, but it was the gold and the silver that created the most income. Whenever the price of copper dropped they would simply install another mill, for quantity not quality gave them more gold and silver to sell. By the time the mine closed there were fisteen mills available to process the ore. The pit in 2011.Note the green of the copper. On the left is what remains today of one of the accommodation blocks in Panguna. The mine provided houses in Arawa for their married staff and single-men's accommodation up at Panguna where it was also much cooler even if very wet. There was a small store and a postoffice selling colourful bird of paradise stamps, and a beautiful church. On the hills behind local villagers used slash and burn tecniques to plant tara and cassava as well as other vegetables. There are no longer and pigs left to hunt, but the villagers do hunt the few remaining possums and the big fruit eating bats.